My good friend Jackie has been hiding something from me, well from a whole bunch of us actually. I just got to know several days ago that she has a long, lost sister whom she's never met! Jackie doesn't even know her own sister's name. If that isn’t one of the saddest things I’ve encountered on the Net, tell me what is! Ever since we became friends (it was during Janice’s family crisis, that Jackie visited Mariuca’s Perfume Gallery to leave few comforting words Just for Janice), she has been very supportive of both my blogs. Through her lovely blog, she has shown me that kindness and joy do exist in this surreal blogosphere we live in. She even presented me with this lovely award! According to Jackie, "The Golden Rose award made by me and given out of sheer joy for all that you do. They are the key to my heart which you have won as well as the key to the hearts of many that you already have. It comes attached to no meme or link back....it is purely given out of love and respect!" Thank you so much Jackie for taking the time to acknowledge my humble blog. 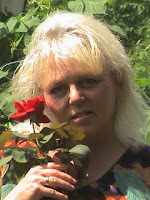 I feel truly blessed and am overjoyed to be one of the Golden Roses in your blogosphere! You’ve been such a great friend to me, and there’s nothing better I’d like to do than to help locate your lost sister by featuring this heartfelt post written by the talented NAFA team. NAFA, may your wish to build a better community for everyone be granted by the Genie King & Genie Princess! Jackie, take comfort in knowing that many of us are here to help you in your search. There is nothing greater than reuniting the unbreakable bond between a lost love. The joy you’ll savour when that day finally arrives will overcome all the pain you must be feeling now. Jackie is a really wonderful person who deserves all the love and support from us right now. We're all hoping that she will reunite with her sister soon. Marzie, thanks a lot for posting this up. Don't feel bad abt being late. We knew u were not well. But it is here now and we're so happy that u want to be part of this! Jackie would be more than grateful too. Hi Nafa, thanks for being my first commenter! Oh yeah, I was surprised when I read ur post on Jackie, would never have guessed she was harbouring this deep dark sadness in her all this while! Here's hoping that Jackie's search will end on a happy note. And thanks to NAFA, for initiating this effort. NAFA rocks! I sure hope it helps too. It's the least we can do. Emila doesn't have a thing to worry about. She has higher page rank than any of us. Technorati authority isn't nearly as important. When Google cancelled my Adsense they took away my pagerank too. It's possible that I may have to start a new blog from scratch. If I don't have a pagerank of 3 or better after their next update my blog could possibly be a lost cause. All that work for nothing.We will see! I don't know yet. I already started from 0 twice. I am not very happy with Google. As far as I know, my site is not in the sandbox (where they put sites to punish them, you remain unlisted and your pagerank is stripped) so I should have a good page rank after. I'm worried they may start punishing blogs for having too many "irrelevant" incoming links. We shall see in a month or so. Great, let's get the word out! hi marzie, congrats on your award! love the design & meaning of this award. You've definitely captured my heart too! :) Jackie is so sweet for spreading her golden roses to others. Yay! Jean is back, hope ur feeling better now sweetie! Thanks Jean, I love this award too, it's so pretty huh? And we're all hoping that Jackie gets reunited with her long lost sis. I'm sure Jackie appreciates ur kind words for her here too! Love n Hugs! Oh wow.. what a touching post.. any update on the situation GP?? hope jackie meets her sister. i try to digg into her post tapi macam takde je. apa kata kalau kita tanya jackie?